Foxy Production presents NETWORKED NATURE, a group exhibition that inventively explores the representation of “nature” through the perspective of networked culture. The exhibition includes works by C5, FutureFarmers, Shih-Chieh Huang, Philip Ross,Stephen Vitiello, and Gail Wight, who provocatively combine art and politics with innovative technology, such as global positioning systems (GPS), robotics, and hydroponic environments. In their work Perfect View, San Jose-based collective C5 reached out to the subculture of recreational GPS users, or geo-cachers, asking them for their recommendations of “sublime locales.” The submitted latitudes and longitudes provided the guide points for a thirty-three state, thirteen-thousand mile motorcycle expedition by collective member Jack Toolin, who photographed the terrain at the given coordinates. The results, presented in triptychs, smartly subvert traditional representations of landscape and notions of the sublime. San Francisco-based collective FutureFarmers’ Photosynthesis Robot is a three-dimensional model of a possible perpetual motion machine driven by phototropism – the movement of plants towards the direction of the sun. Their proposal that a group plants will very slowly propel a four wheel vehicle is a witty take on the pressing search for new forms of energy. New York artist Shih-Chieh Huang’s inflatable installation, EX-S-S-TW, is inspired by everyday household electronic devices and his studies of physical computing and robotics. In this ingenious exploration of organic systems, he creates a dynamic circulation of electricity and air: a living micro-environment. San Francisco-based Philip Ross’ Juniors are self-contained survival capsules for living plants. Blown glass enclosures provide a controlled hydroponic environment, where plants’ roots are submerged in nutrient-infused water, while LED lights supply the necessary illumination. The artist has drawn on two culturally divergent traditions – Chinese scholars’ objects and Victorian glass conservatories – that share the belief that nature is best understood when seen through the lens of human artifice. Virginia-based artist Stephen Vitiello’s Hedera (BBB) unsettles our assumptions of what an appropriate soundtrack might be. The artist has constructed a sprawling vine installation with speakers hidden between the branches that quietly broadcast percussive sounds woven from the speeches and private conversations of George W. Bush and Tony Blair. Creep, by Oakland-based Gail Wight, is an hypnotic three screen time-lapse video of the growth of dyed slime mold. Separately edited sequences play alongside each other, cycling through a sequence of fluorescent color shifts. In her aestheticizing of the normally repellent, Wight creates an ode to the beauty of natural growth patterns. 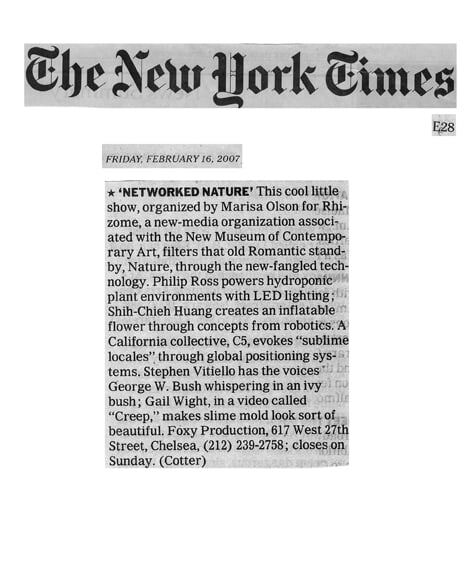 Networked Nature is organized by Marisa Olson, Editor and Curator, for Rhizome. The exhibition will tour to the Warehouse Gallery in Syracuse, New York. Networked Nature is supported, in part, by The Andy Warhol Foundation for the Visual Arts, the College Art Association, the New York City Department for Cultural Affairs, and with public funds from the New York State Council on the Arts, a state agency. A full-color catalogue will be published by Rhizome and available at the gallery. Falconer, Morgan. "Networked Nature." Art Review. 9. Mar. 2007: 142. Cotter, Holland. "Networked Nature." The New York Times. 16 Feb. 2007: E28. Davis, Ben. "Net Worth." Artnet. 14 Feb. 2007. Web. Hanley, William. "On The Horizon: Our Top Ten List For 2007." artinfo.com. 3 Jan. 2007. Web.